I begin with a one-question quiz. It is multiple choice. The correct answer is “C.” In 25 years demographics and median age declares the average United Methodist living today in the United States will be…dead (me included). I departed for active duty ministry as a Navy chaplain endorsed by the Southern Illinois Conference in 1977. The year I departed the conference claimed 68,000 members and an attendance of roughly 30,000. When I returned in 2005, 9 years after a merger with the former Central Illinois Conference (that was nearly twice the size as its southern cousin), the merged Illinois Great Rivers conference had lost nearly all of the numbers of the former southern partner. By 2017, the year I retired, the numerical journey to oblivion was complete. The Illinois Great Rivers conference had fewer members and worship attendance than the former Central Illinois conference had 21 years earlier. The numbers added by the former Southern Illinois conference had disappeared without so much as an obituary or a burp. The issue is not the statistics I have shared. That is a symptom. The issue is that when I returned from the Navy to my conference I was stunned by the lack of urgency in responding to this decline. Everyone had some level of awareness, everyone agreed it was not a good thing, everyone knew something ought to be done, but no top-to-bottom, profound, focused or dramatic change had been implemented to alter a course leading to functional extinction by 2050. The absence of focused urgency mobilized to address the collective challenges facing the US church is the issue far transcending the debate over sexuality. The Hezekiah Syndrome – drawn from the sad story in 2 Kings 20. King Hezekiah has a successful reign but late in life steps outside the will of God. The prophet Isaiah confronts him and declares the kingdom will crash during the reign of Hezekiah’s son. Outwardly the king coos, “God’s will be done,” while inwardly he thinks, “Who cares, since there will be peace and security in my time” (2 Kings 20:19). The Hezekiah syndrome knows is one where the pastor, the bishops, the leadership clearly knows the great sucking sound is the future headed down the drain. But the crash will come after retirement benefits have been collected by those currently in charge. Profound change is hard, demanding and too much work, so those best positioned with the power and experience to begin decisive change beg off. Age, physical limitations, hassle and heartache are too great to make it worthwhile. Human nature is prone to inertia in such matters, so change is limited to tweaking the edges, or ploys such as closing a dying congregation and merging the leftovers with another congregation…while declaring the process to be a new church start! The Agag Syndrome – drawn from the unfunny episode where the prophet Samuel “hewed Agag into pieces before the Lord” (1 Samuel 15:33). This is the merry role assumed by fighting within the church or denomination about this or that. Success gets defined as stopping something. The cross-stitch in the church office reads, “Happiness is a known enemy,” and no day is complete without spending spiritual and emotional energy ‘rounding up the usual suspects.’ They can be liberals, conservatives, promiscuous gays and bigoted straights, Republicans, Democrats, Klingons, whatever. The current ongoing brawl in the denomination over human sexuality is exhibit A. Clearly matters of principle require a firm stand but when nearly every church and pastor engaged in the tussle reflects a church flat-lined or declining in attendance, energy is being misplaced by the system’s process for extending rather than resolving the dispute. Annual conferences have elected 850 honorable insiders and tasked them to think outside the box for the called General Conference in 2019. Naming and taming the play-it-safe Hezekiah temptation, the Agag impulse and the Court Lackey attitude are crucial to a way forward that truly is forward and not simply steaming safe squares in the vast ocean of religious administrivia. The main issue remains. How does the US church reclaim life in the face of its increasing romp toward death? The decline is the bitter fruit of the church’s wicked problem, a combination of issues that have created an ongoing perfect storm for the faithful laity and clergy who are the heart of the church. Trust deficits, faulty communication, demographics, finances, obsolete personnel preparation and assignment processes, outdated and ineffective organization, inability to offer a shared and measurable definition of the mission of the church (what exactly is a disciple and how does one “make” a disciple), are among expressions of the wicked problem. 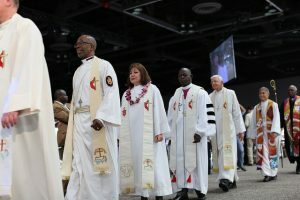 So let two versions, or twenty versions of existing United Methodism form as part of the 2019 General Conference. Let the 2020 General Conference be a watershed to focus on spiritual and practical renewal and reformation, top to bottom, with all sacred cows offered for a delegate barbecue on the first day. We can walk with wisdom and foresight into profound change or let consequences and reactions push, kick and smack us into thought-less change that does no honor to God nor bring healing to a floundering system. In Philippians 3 Paul offered a list of what he gave up, lost, and surrendered and the richness of life in Christ gained as a result. Wise change, deep and pervasive, Spirit-led and Scripturally sound is the way forward. The need is…urgent. Dr. Bob Phillips is an elder in the Illinois Great Rivers Conference and a delegate to General Conference 2019. Bob retired from the U.S. Navy as the highest-ranking United Methodist in Naval Chaplaincy. He retired from active ministry as the pastor of First United Methodist Church in Peoria, Illinois.